Dimensions: 40"W x 17"D Height adjusts: 32" to 60"
Those college closets can be pretty small. When you're unpacking your college supplies and clothes on move in day, you may find that you have filled your dorm dresser and closet to the maximum with the clothes you need. You may have even filled your dorm trunk with extra seasonal clothes and found that you still didn't have enough room. This can be pretty stressful on an already slightly stressful day. 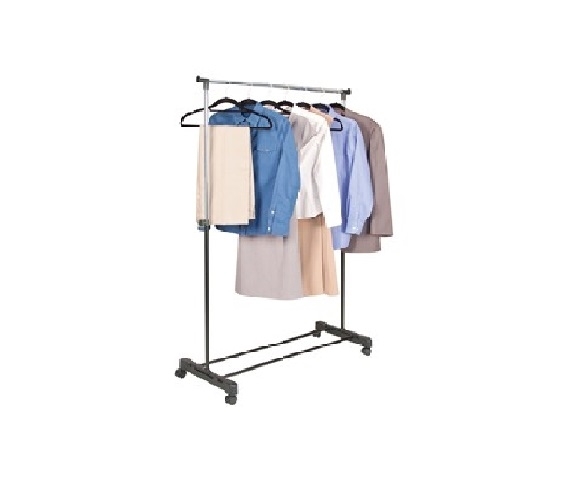 For extra dorm room storage space for your clothes, look no further than our Adjustable Dorm Garment Rack! Our Adjustable Dorm Garment Rack has an adjustable height so you can make it as tall as you need it to be and it will also hold plenty of extra dorm essential clothes. Don't know where to keep your bulky coats or sweatshirts? Keep them on our Adjustable Dorm Garment Rack and always have them within arm's reach when you're going to class. College supplies need to be compact in order for them to be useful dorm items, and with our dorm garment rack, you will have a compact, portable option for storing your extra dorm necessities!